Sat., March 31, 2018, 8:14 p.m.
Eastern Washington is coming into spring football with an attitude. The Eagles also have the aptitude, along with experience and sheer numbers, for an energizing month of spring ball that should carry through into the fall. 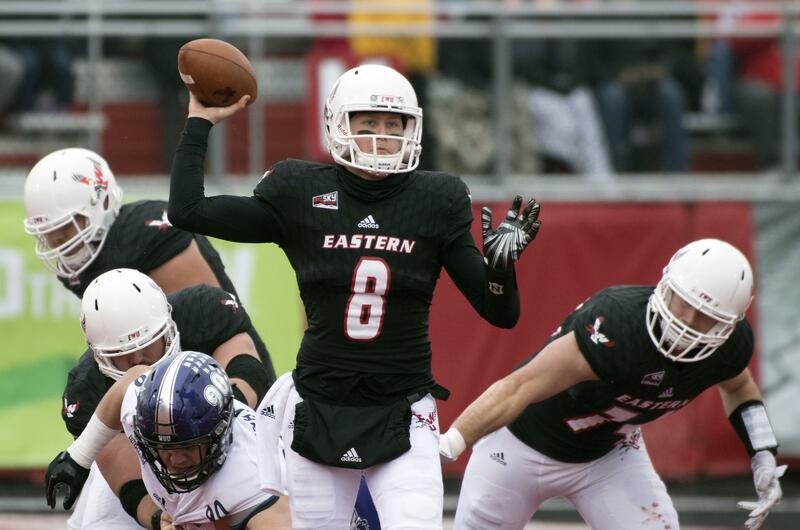 Left out of the FCS playoff field despite a 7-4 record and third-place finish in the Big Sky Conference, the Eagles hope to leave no doubts this time. The road back started in the weight room last winter. It continues at Roos Field on Tuesday, when the Eagles open spring ball for the first of 15 sessions. Spring football will conclude with the Red-White Spring Game on April 28. Coach Aaron Best returns 56 letter winners, 17 starters and a large class of 28 seniors – more than the previous two seasons combined. “It’s unusual and abnormal, but we’re OK with it – I like strength in numbers,” Best said. With so many seniors and returning starters, the emphasis on spring will be getting reps for newcomers and backups. That’s particularly true at quarterback, at which redshirt sophomore Eric Barriere backs up prolific senior Gage Gubrud. With most games going down to the wire last year, Barriere appeared in just five games and threw only 26 passes. “We’ve seen what Gage can do on Saturday,” said Best, who wants to give Barriere as many spring reps as possible. It’s the same story at most positions: With most of the starters being seniors, the Eagles need the backups to gain as much experience as possible to avoid a major dropoff in 2019. “The goal is to make every single position on both sides of the ball as competitive as possible,” Best said in his podcast last week. For the 17 redshirts from last year – “presents under the tree,” as Best calls them – that means a chance to compete for playing time for the first time since they were high school seniors in the fall of 2016. The Eagles ranked sixth in the nation last year in total offense, but they also turned the ball over 23 times, including 14 interceptions and nine lost fumbles. Those aren’t awful numbers, but the EWU defense only managed 13 takeaways, leaving the Eagles minus-10 in the turnover department. Opponents threw the ball 400 times, but only six of those passes ended up in the hands of Eastern defenders. “We have to keep the football, and on defense take possession away,” Best said. For the second time in eight months, the Eagles are looking to fill an unexpected vacancy at left offensive tackle. Brett Thompson, who started the last eight games last year as a redshirt freshman, has left the program for personal reasons. Fortunately, the Eagles return nine letter winners on the offensive line, plus two redshirt freshmen. Last fall, left tackle Nick Ellison left the program two weeks before the season to focus on studies, forcing some juggling along most of the line. This time, the Eagles have more time to adjust. Published: March 31, 2018, 8:14 p.m.